Decorative Life: About 14 days. Relatives include daylily, hyacinth, tulip, lily-of-the-valley, poker-flower, lily. Foliage in a flat triangular, feathery pattern on stem. Stems to 16 inches, classed as a monocotyledon, leaves mostly parallel veined. Plant is a herbaceous perennial from tuberous roots. Store at 36-41F, up to 5 days dry, up to 14 days in water. This species exhibited a vaselife of 9-12 days after dry storage for 30 days at 39F. However, some recommend that dry storage only be used if wet storage is impossible to accommodate. Bagging (dry storage) or covering (wet storage) with plastic to reduce water loss is recommended. In general, one day of storage can result in one-day loss in vaselife. 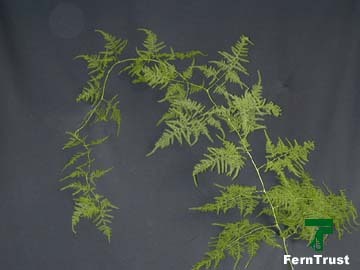 Not a true fern. The fruit-like structures that sometimes are present are just that, fruit. Many forms including dark and light colored, trailing or erect. Good quality stem should end in a tip (“full palm”). The specific epithet name setaceus means bristle-like. While listed as non-ethylene sensitive, an anti-ethylene treatment has been shown to be beneficial prior to storage for two weeks.